These Championships combined quality racing, a quality course and quality organisation. The tail breeze added to the quality field to make sizzling times to compliment the event. The point score for the most successful Member Association at the regatta was won by Victoria in the final race, the King's Cup. The Tasmanians finished a close second. Organising Committee: Susan Stegman (Chairman), Paul Christensen (TRC President and Sponsorship), Jim Gibson (Finance), John Oakley & Mick Goodger (Regatta Control), Rod and Annette Dolbel (Secretary & Programming), Jack Ellings (RA Liason), Chris Grummitt & David Pitt (Timing), Greg Hall (Venue Manager), Ivan Dolbey (Catering), Peter Wade (Media), Helen Street (Protocol), Alan Kitto (Communications), David Pitt (IT), Peter Wade (Volunteer Management) and 120 volunteers. Jury: Andrew Guerin (VIC - President of the Jury), Michael Banks (TAS), Ron Beattie (NSW), Michael Eastaughffe (SA), Rod Florence (VIC), Phil Fraser (TAS), Roy Hinchy (QLD), Peter Huggett (QLD), Nick Hunter (ACT), Craig James (WA), Rene Klupacs (VIC), Tony Levick (QLD), Paul Logan (SA), Reg McKay (VIC), Greg Melbourne (SA), Brian Nash (WA), Bob Pennington (SA), Norm Saunders (SA), Caroline Schomberg (QLD), Tim Wainman (NSW), Brett Woolfitt (WA). 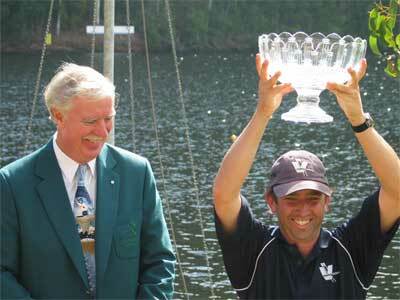 Scott Brennan made it two years in a row with a start to finish win. A strong third 500 metres held off Peter Hardcastle run. However Peter made Scott work hard in the last 500 metres with a strong finish. This was one of the great races of the day. 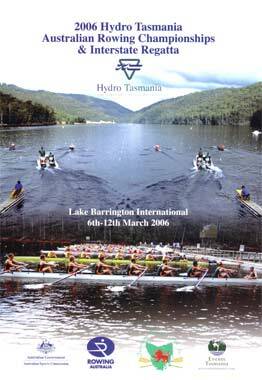 Tasmania had a very strong last 1000 metres and took the lead from WA late in the race to win 0.58 seconds. The Rowing Australia website reported that the win, as stroke Tom Gibson said, was made all the more special after Tasmanian lightweight legend Simon Burgess handed out the gold medals. "I've rowed the last couple with Burgo: to do it for him as well as being at home in Tassie, and with him there and watching it, I'm really glad we could continue it after he's left," Gibson said. New South Wales led all the way with a great first 500 metres. The margin gained in this first part of the race they maintained throughout the race. There was a good race between South Australia and Victoria in the first 1500 metres of the race with South Australia getting the best of Victoria in the thrid 500 metres and then going after New South Wales in the final stages of the race. The Tasmanians were confident that Dana would win and she did not disappoint them. Dana's start was spectacular and no one was able to catch her from that point. Last year's winner Sally Kehoe tried hard to keep with Dana Faletic maintaining second place through the first 1000 metres. Sonia Mills had a great finish coming from fouth place at 1500 metres to second place at the finish. Despite a strong third 500 metres by the South Australian crew, the Victorian crew prevailed throughout the whole race. The Victorians led throughout the race despite a strong race by the South Australians in the last 1000 metres.